The Papillion City Council has approved a significant data center project in Sarpy County, Nebraska. 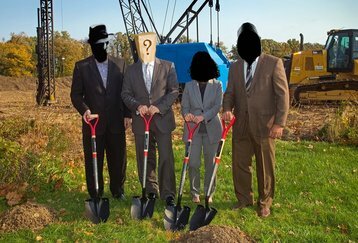 But the company behind the 146 acre Sarpy Power Park, which will feature four 610,000 square foot (56,670 sq m) data center halls, has yet to be revealed. Andrew Rainbolt, executive director of the Sarpy County Economic Development Corp, told the Omaha World Herald that project organizers are hoping for a spring groundbreaking at the new site set on both sides of Highway 50, just north of Capehart Road. He added that he hopes the company building the data center will make an announcement in early 2017. Records show that the company is currently being represented by Olsson Associates, an infrastructure engineering and design solutions company. It is not unusual for large companies to hide the fact that they are behind a data center project until the last possible moment - sometimes to ensure that tax break negotiations are not wrapped up in discussions over the huge profits the company makes, and sometimes to ensure that their data center plans are not easily followed by the competition. When Facebook considered either Utah or New Mexico as the location for a major data center project, it operated through a company called Greater Kudu LLC. The company was created purely for the purposes of Project Discus, the data center, and allowed Facebook to engage in covert lobbying for months before Kudu was linked to the social network. Microsoft has also long shrouded its data centers in secrecy, recently revealing itself as the company behind Project Osmium, a West Des Moines data center that will cost $417.7 million for just its first phase. Whoever is behind the new project will find themselves with plenty of company - Sarpy County is home to a number of data centers, including ones from Yahoo, Travelers Insurance and Fidelity Investments, as well as an upcoming LightEdge facility. Sarpy is just on the edge of Nebraska, bordering Iowa, which is also teeming with data centers. On the edge of the border, only 25km from the Sarpy Power Park, is Google’s multi-billion dollar Iowa data center.